We have limited stock of the following second hand Autodata books. All in very good condition! 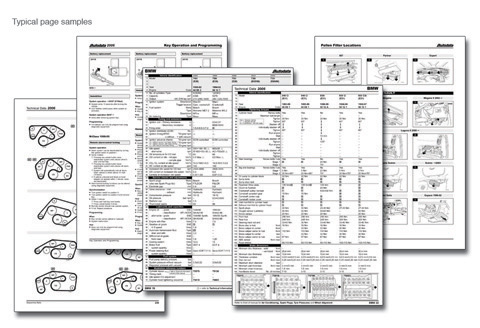 Those automotive data information books contain vehicle manufacturers specific diagnostic procedures with expected values, component locations, diagnostic procedures etc. etc. See http://www.autodata.ltd.uk/manuals.asp for more information. Note: We do not sell New Autodata books & CD's. This excellent book contains thousands of Diagnostic Trouble Codes and their proper explanations! It also have an indebt explanations of Why the codes where set and How to proceed with further diagnosis of the faulty components. The book is an indispensable companion to anyone working with a code reader or data scanner even if it's a professional one. Comprehensive explanations of how and why fault codes are activated and how to proceed with repairs. Chapter 4: ISO / EOBD Fault Codes (over 360 pages covering all P0, P2, P3 and U0 codes and their proper definitions. No more abbreviations or code hunting. This book is an excellent tool for professional diagnosticians and all DIY mechanics. See an example page. For other technical data or software information give us a call.